From the Anguilla Local News - Site Map. 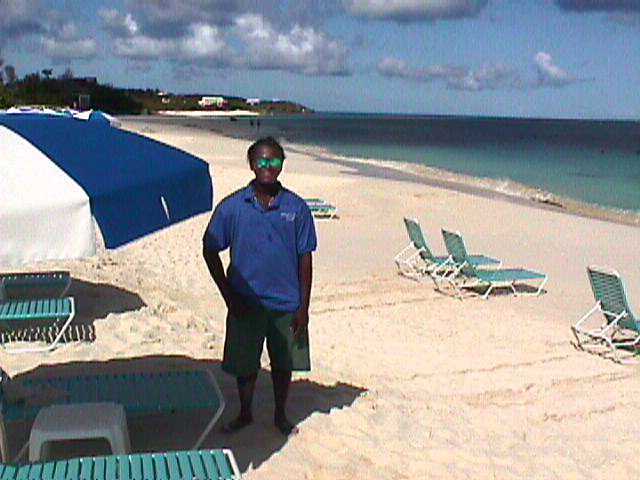 Raymond is one of the beach helpers for Skyline Sports on Shoal Bay beach. You may have seen their moving store that looks like it has not moved in 5 years and the beach attendants with the blue T shirts. Skyline Sports have a web page at net.ai/skyline for their rental business next to Uncle Ernie. They rent everything you need for a day at Shoal Bay (umbrella, snorkel, chair, raft, locker, etc.) from booth on wheels or their beach rep. They have been in business since 1987, when Shoal Bay was empty except for Uncle Ernie's bbq grill and the Shoal Bay Villas. Their prices today are the same as 11 years ago, except that one item has gone down in price! Their motto is "just bring yourself and your suit, we can provide the rest." Telephone: 264-497-8644. Mail Subscribe Submit news Maps Fly!